So you’ve just joined Entrecard? Welcome to the club :) I promise that you won’t ever regret joining Entrecard. A reader of my blog (Gerardo @volkdefense.com) introduced me to Entrecard about a couple of months ago. I’ve never regretted my decision since then. I’ve gained hundreds of traffics from Entrecard, discover other great blogs, meet friends who have become my loyal readers and commenters. So, hope that you will enjoy your stay at Entrecard too! At Entrecard, you have your own “business card” (a 125×125 image) in which you can drop to other people’s “mailbox”. Imagine that you have a real business card, containing your profile and also your home address on the card. Each day, you can walk around to other people’s houses and drop your card to their mailboxes. This way, you are promoting your house that is written on it to the house owner. After dropping your card to one house, you go to other houses, and so on. Of course, other people will do the same and they may come to your house as well to drop their business card. You are also allowed on each house, to advertise about your own house, so that other people can see an advertisement about your house on other people houses. Picture: Each house has a mailbox in which other people can drop their card into, and an advertisement space, where other people can advertise about their own house. 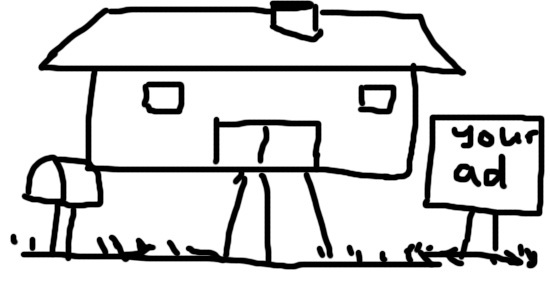 A house = a website or a blog. The house owner = the owner of the website/blog. Business Card = Entrecard’s profile. Mailbox = Part of the Entrecard’s widget, in which you have to put the code on your site/blog. The Advertisement space = Part of the Entrecard’s widget, displaying other people’s Entrecard profile. That, in a nutshell, how Entrecard works. You drop your Entrecard profile to other people’s Entrecard profile and they will do the same to you. Your Dashboard is your life (at Entrecard, that is) :) Understand it inside out. I’ll cover the basics first here, and I’ll put up the rest when I have the time. However, you can figure out most of them by yourselves. 1. Your Entrecard email account, how many credits that you have and how many drops have you made today. 2. Most recent drops to your mailbox. Indicate the most recent people that dropped their Entrecard profile to you. The most recent one will be the one on the far right. To see all recent drops, please go to the “Drops inbox” (one of the tab – Summary, News feed, Drops Inbox…). In here, the most recent one will be on the top left. So first row from left to right, and then second row from left to right, and so on. 3. 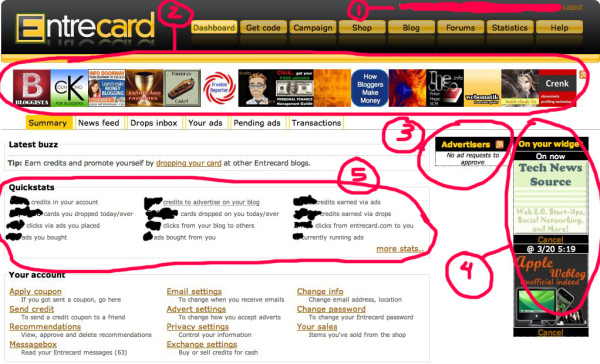 When someone wants to advertise on your site (through the Entrecard Widget), it will be shown here. You then have to either approve or decline it. You can click on the Entrecard profile to view it before you make a decision. Don’t worry, no hurry. The Approve and Decline links are located below the profile picture. I couldn’t find it myself last time because of the color heh heh. 4. All approved ads by you will be shown here. Note that this is a queue. The one on the top is the one that is currently being displayed on your site/blog through the Entrecard Widget. 5. Quickstats (I’m sure you can figure this out on your own). If you are not sure about a stat, just ignore it for the time being, as it’s not crucial at this early stage. Remember, they will all be queued and there is a maximum number of queue per Entrecard member. You don’t want to get hundreds of requests now, do you? Please help to spread around this guide by stumbling this post or bookmark it on your favorite social site! Q: What is a Shop? It’s a place where you can spend your Entrecard credits for something else instead of use it for advertising. Have a browse and you should have an idea what is it. Q: How do I sell stuffs like others in the shop? Q: How to determine the price to advertise on a site/blog? The more drops that a blog/site gets, the more pricey it becomes to advertise on it. PS: This is not a complete guide. It will take some time to knock up a good one. However, since we are having this contest/give away for new members, I’m sure that this will help those who have just joined and probably got overwhelmed by the Entrecard system!